﻿﻿From January 10th to January 19th, five Hofstra University students along with students from Adelphi University and Stonybrook University, traveled to General Cepeda, Mexico. In General Cepeda a group of full-time missionaries from Family Missions Company welcomed the students into home. Each day the students were broken up into three groups and sent out into the community with the full-time missionaries leading them. The three different groups were evangelization, home visits, and work projects. This allowed the students and missionaries to reach out to as many people in the community as possible in a variety of different ways. At night, the students went out to ranchos, small dessert towns, to spread the word of God. At these ranchos each student was presented with the opportunity to share their own personal testimony, which was a powerful and emotional experience. The students feel very blessed for the opportunity they had to serve the people of General Cepeda. Check out our Missionary Blog for posts from the students about this mission! From March 15th to March 22nd, eight members of the Hofstra Catholic Campus Ministry and Newman Club communities traveled to Jackson County, Kentucky to participate in the Christian Appalachian Project's WorkFest. Hofstra students joined in with volunteers from four other universities to help build and renovate houses for the people of Kentucky. While making new friends and learning new skills, members of our community also got to build relationships with the homeowners they were serving while working and praying together over the course of the entire week. At the week's end, each person on the team left with an unforgettable experience of faith, service, and community. We're already looking forward to participating again next year! 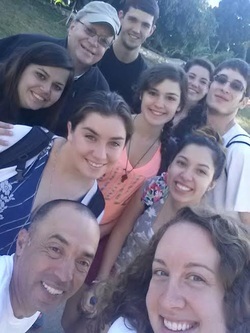 From January 7 to January 15, members of the Hofstra Catholic Campus Ministry and Newman Club communities traveled to the mission of the Diocese of Rockville Centre in El Cercado, Dominican Republic. They spent their time working with Monsignor John Cervini and the beautiful people he has been serving for nearly fifteen years. Their experiences included working at a peanut factor that produces food for malnourished children, visiting and serving with the Missionaries of Charity, aiding nurses from the University of San Diego in their examinations of school children, and celebrating the Sacraments with different villages. Our missionaries also visited aqueducts and worked on local agriculture projects that directly impact the surrounding communities. They had a life-changing experience getting to know and love their brothers and sisters in Christ in the Dominican Republic, and we look forward to visiting again in the future. 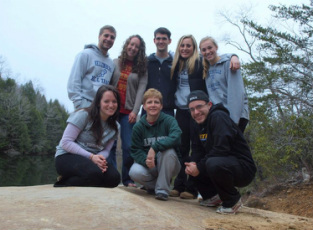 From Palm Sunday to Good Friday of this year, eight members of the Hofstra University Catholic community traveled to Whitley County, Kentucky to participate in the Christian Appalachian Project's WorkFest. Hofstra students joined in with volunteers from four other universities to build porches, put on roofs, install siding, and lay flooring. While making friends and learning new skills, members of our community also had the opportunity to build relationships with the homeowners they were serving, working and praying together over the course of the entire week. At the week's end, each person on the team had had an unforgettable experience of faith, service, and community. We are already looking forward to participating again next year! Check out our Missionary Blog! Hofstra and Adelphi joined forces for our winter mission this year right here in Long Beach, NY. The mission team was based out of St. Mary of the Isle parish in Long Beach, where the guys also stayed. The girls were housed in Our Lady of the Miraculous Medal in Point Lookout. The 22 person mission team split into different work groups every day to do a variety of work projects around Long Beach and Island Park, including demolition, rebuilding, sheet-rock, insulation, clean-up, painting, and evangelization. Each day, the mission team also came together for daily Mass, adoration, and morning, evening, and night prayer. The community grew together as a family in faith and each person was definitely changed for the better! Hofstra University students along with Family Missions Company (FMC) went to Joplin, Missouri for an alternative spring break mission trip. While there, they stayed at a Project 195 house and worked with long-term volunteers on various work projects. They worked at a little league baseball field that has historical value to the town and helped fix up houses, including the one they stayed at, in order to eventually give them away to families. They also did some evangelizing by having a praise and worship night, visit neighbors and praying with them, and visiting the sick in the hospital. God worked through every person on this trip and they were able to bring what they learned in Joplin home. Hofstra and Adelphi University students teamed up with Family Missions Company (FMC) to go to Misahualli, Ecuador. While there, each student had the opportunity to share a personal witness of Christ in their life to different communities on the outskirts of the town. The students and campus ministers, alongside two full-time FMC missionaries, went out each day to be with the people in these scattered villages; they prayed and played with the children of the villages and interacted with the adults, with the little Spanish many of them knew. There was one night in which the students put on a youth night at the church in Misahualli in which Adoration was offered as well as fun and games with the youth. One day really stands out in which, as you can see from the picture to the left, the group hiked two hours through deep mud and woods to get to a remote village with only two or three families. The group was able to bring Mass and the Eucharist to this village for the first time ever!! It was a beautiful day and although they hiked back in the dark after a rainstorm, and ended the day exhausted and tired, it was well worth it.